Like fine wine slowly poured into a glass, the Tahoma Room on the University of Puget Sound campus filled with book artists arriving for the annual Puget Sound Book Artists members meeting . Those attending the event, find it creates an ambience not found anywhere else. Add a new location, a new date and time, and the anticipation almost takes on a life of its own. We came to enjoy a Continental breakfast and to peruse the silent auction table in the hopes of placing the winning bid for a new found treasure. We came to listen to Yoshiko Yamamoto of the Arts and Crafts Press speak about her work, and we came to learn what we, the Puget Sound Book Artists had accomplished in 2014 as well as our goals for 2015. I think most importantly though, we came to share with friends, both old and new. Like that glass of fine wine, it was a day to savor, and I can think of nothing more enjoyable than sharing a glass with good friends. 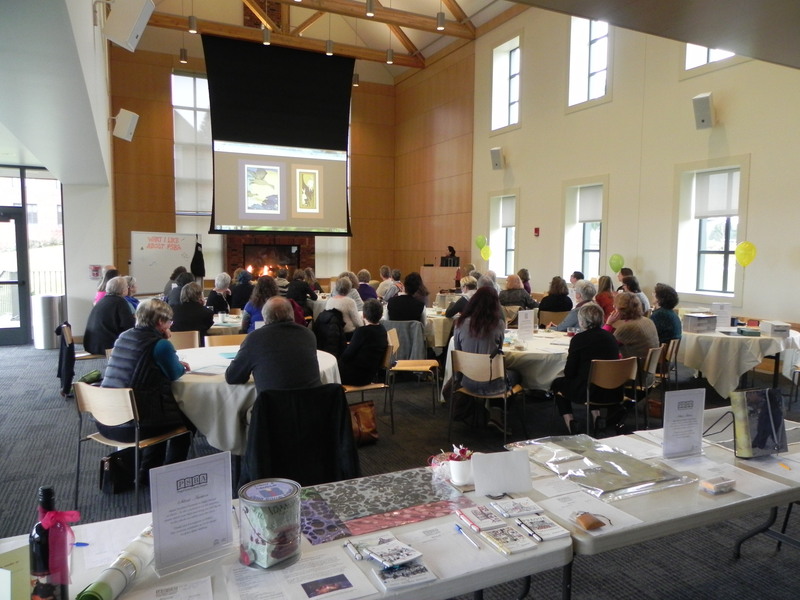 Everything the Puget Sound Book Artists accomplishes is made possible by our members; through membership dues, volunteer work, support of our Silent Auction, and of course attendance of our lectures, presentations, and workshops throughout the year. Thank you to everyone for making our organization such a success. This entry was posted in Archived Events, Lectures & Presentations. Bookmark the permalink.